I’ve always been fond of the movie What About Bob? and partly because it has that great theory of baby steps. Of course Bob makes it hilarious- Baby Stepping out the door. Baby stepping into the elevator. But the truth of that theory has worked for me. I don’t like to set big New Year’s Resolutions because it feels like too much to take on at once. I prefer the method of adding on something small to medium-sized and re-evaluating at the end of a month and the beginning of the next. It’s how I combat procrastination – I spent how many hours playing video games this month? (Okay, that was a couple years ago- I don’t do it much now.) I’ve turned much of that time into more productive activities toward my goals. So when someone close to me rattled off a median income for writers as “$70 000 a year,” I almost fell off my chair. And I was belted into a car. Median is supposedly the middle of all the writers out there, so while a straight average might take into account the big earners like Patterson and King and Rowling, the middle would be where the 50% percentile earner had income. I’m skeptical. I want proof. I couldn’t get it, and I’d like to see where that kind of number comes from. There are so many writers out there, some of whom only send out one book and self-publish, some of whom have one book and traditionally publish, and some of whom keep sending out book after book. Some of these make great money, and others struggle along without much notice. That median supposedly takes into account all writers, nonfiction and television and tech writers and fiction. If that had any truth, wouldn’t more of us be attempting to be writers? Mostly, the part that makes me sad is when I think about that as a goal, as an answer to when I’ll be successful is when I hit the median of “writers,” it feels impossible. I don’t rise to impossible overnight. I like small goals. Like, how about, make more money this year than I pay out? And try to do that a couple years running? Please send me a comment with what you think it takes to be a successful writer – and what the goals are that keep you going on your path. Yesterday I completed 720 days in a row of writing at least 750 words per day. I also received a rejection for my manuscript from an agent. Today’s task list includes rewriting. I haven’t given up on this writing dream. Does an Outline Prevent Discovery? Plotters and pantsers make up the ends of the spectrum of writers about outlining. Some hate the word, while others live by the outline map. I happen to be someone who outlines. It wasn’t always this way, but I have come to find a way to outline that keeps me focused on the story ahead. The biggest complaint I hear from pantsers (the ones who write by the seat of their pants) is that if they outline, they’ve already written the book. What’s the point? Maybe we have too much thrown into the category of outline. I remember them from school with the Roman Numerals and the Arabic numbers underneath. Someone must still use that kind of outline, but not most of the writers I know. But the key to a great outline is to allow enough to keep in mind the end while not tying hands too much to get through the story. And it isn’t like an outline is set in stone. If your characters mutiny against it, the writer had better understand what happened – and act accordingly. The choice is to change the characters so they’d choose to run through the outline, or change the outline so the characters want to travel that direction. How much of an outline is enough? It’s what keeps the writer on track with the story. If it’s enough to have that vague image of an ending in your head through the writing – go for it. An outline can be as minimal as fifteen words or as detailed as a snowflake. It’s simply a tool to work for the writing. So does any kind of information go against the discovery of the novel? Is it forbidden by the pantser to make character sketches or physical sketches of settings or to write out the history of the world before the story begins? Maybe because I write science fiction I struggle with this. I might have years to cover with changes to the characters, society, and technology to get to the point where I want to begin the story. But then again, perhaps I just overthink these things. Maybe you have your own examples of those books that have those little questions that keep you awake at night. It isn’t really possible to answer every single question about a world, but the writer ought to know. Some of that is always discovered for me while writing, no matter how tight my outline becomes. If you have a way to outline other than these, please share! Did I forget to mention I am a writer? Sometimes I struggle with this in my day to day activities. People who have known me for a long time have seen me shift from one kind of career to another, but a lot of my new friends and acquaintances only see me as mom running my kids around. Funny, huh? All right, I’ll say it out loud. I’m a writer. It doesn’t mean I don’t do a hundred other things a day. It doesn’t mean I don’t have other career paths. However, this is what I love to do and what you can find me doing when I have any spare time at all. Spare time? That’s another funny concept. Time doesn’t create itself in moments that can be considered empty or spare. I make choices about how to spend my time. Every time the little darlings go to sleep, I go to work. I know a lot of people who get ideas. Some of them try writing from time to time. Others are writers like me. There is a difference between the ones who write occasionally and those who are writers. The writers I know have to work through the tough parts. They take each piece and examine it thoroughly. They never stop pursuing those pieces of story until they’re polished. So I have worked other places, doing many other things. I get that faraway look in my eye when an idea comes to me and try to remember it long enough to write it down. I try to only choose things that are fun. And all of it, from that Scentsy party to the towers we build at the Family Museum to the random tidbits I read, contributes to my writing. For me, November always means another novel with NaNoWriMo. During the month, there are plenty of things to read on both sides – writers who love it and writers who avoid it. I don’t think it’s fair to say people hate it if they haven’t tried it. Part of it might be because of books like No Plot? No Problem! The challenge is to write 50,000 words in 30 days, and they recommend little to no preparation – to simply dive into a novel and write. I think a lot of writers just dive into a novel and write in their first attempts. I know I did for several – and the few I managed to finish in that time were in such disarray it has taken and will take me years to sort them out. NaNo 2012 has come and gone, and I have a new novel to work on called The Next Jane. It weighs in at about 73,000 words. I hit 50,000 on Day 15, but the second half of the month presented challenges to keep me from hitting 100,000. I know several writers who have embarked on sequels to a previous work and we are working toward using outlines and all kinds of preparatory work to make sure it is something that has a chance to be salvaged. I mean, we could have a nice romantic comedy going on and then have aliens land to get to the word count, but we’re reaching beyond that. Check out this list of published WriMos. The beauty of the energy and the camaraderie of NaNoWriMo helps to turn off the internal editor long enough to get the rough draft out. You can challenge yourself to finish another scene, another chapter, another book. We post our word counts and compete with what we did the previous year. This year, I wrote more words than I have before in the month of November. I’m proud that I finished the entire draft of the novel, which was my goal in the first place. The rest can be fixed later. I’m fixing my last in-progress novel, and then I’ll be back with TNJ until I get it in order. I really want that one to be great. Plus, I have two sequels planned. Have you tried McCormick’s GrillMates? Some pretty amazing stuff is contained there. The husband’s been trying out a couple of them when grilling. I’ve always loved his creations, but this adds a little flair. 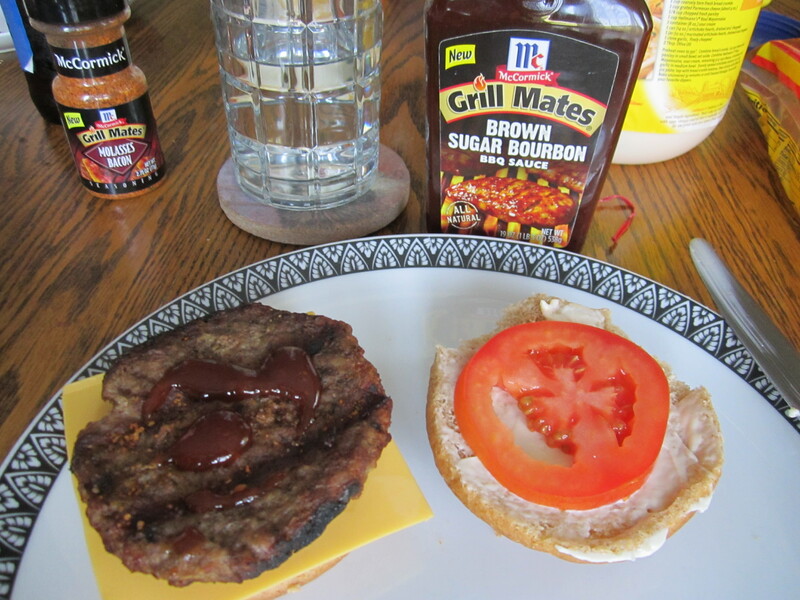 The photo above is of Molasses Bacon seasoning added to the hamburger meat and Brown Sugar Bourbon BBQ sauce. The resulting explosion of taste was beautiful. The meal got rave reviews from everyone who has shared those meals with us. You just might see more of that in our future! What a party! There were mazes to fill out, tic tac toe puzzles to challenge each other with, and connect the dot images to sketch. Everyone grabbed a pen and started things off well. There were even a couple matching picture challenges. 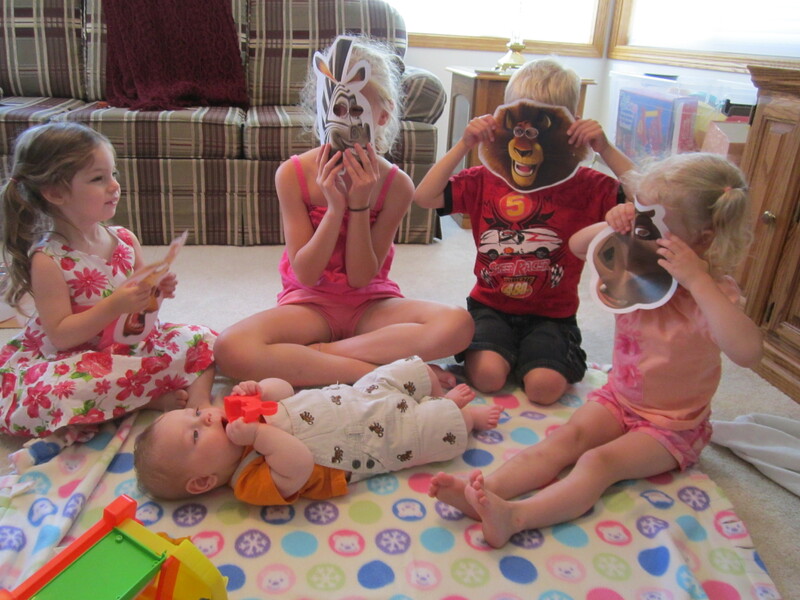 But my favorite part about a Madagascar party was the four kids each playing with the masks and trying to make the baby believe they were characters from the movie. He didn’t seem too worried, but he’s pretty used to his sister throwing him a bunch of curve balls in the way of roars and dropping dragons near him. I taped the faces around the baby’s crib to keep him company. I hope he’s as amused as I am. 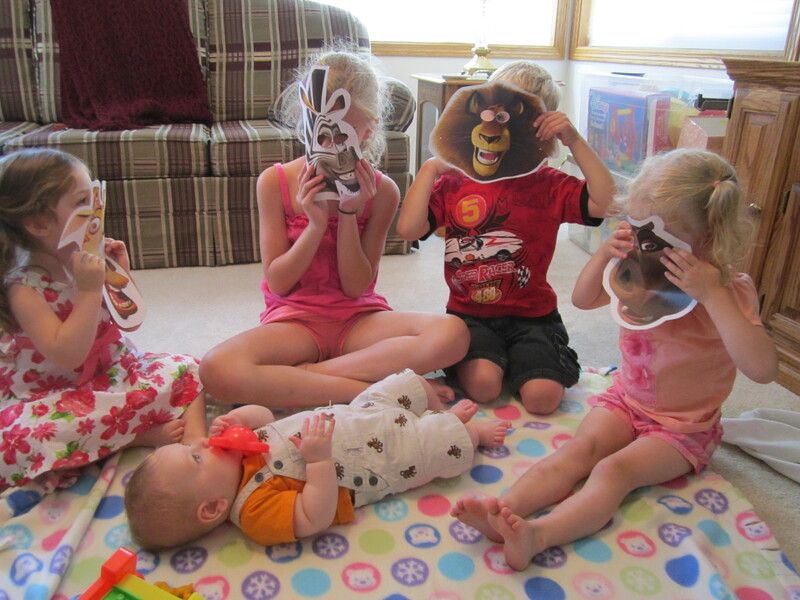 The movie was awesome (but the baby had to stay home), and we can’t wait to watch it again. Hope you enjoy it as much! 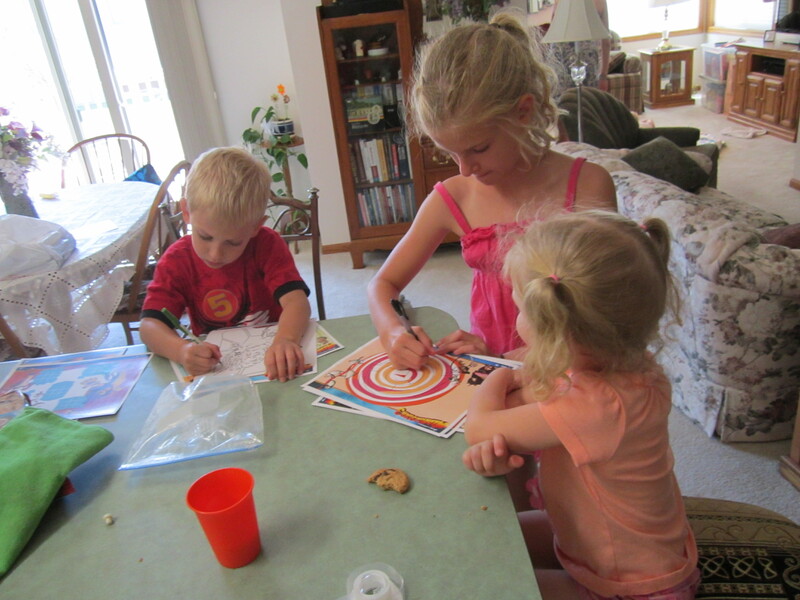 It’s fun to add to the movie experiences for the kids with little take-home games and activities. Some days they do; some days they don’t. I’m excited to say I’m coming up on 300 days of writing in a row at 750words.com. At a minimum daily count, that’d be over 222k words. I’ve written more than that. I actually joined that site a year ago yesterday. In the 367 days, I missed 12. My streak as of yesterday was 297 days. Yes, somehow I managed that through moving (Thanks, Mom!) and having a baby (always with the technical gadgets when he slept) and figured how I could do that minimum through my phone if I had to. The site also tries to give insights into my writing, whether I’m feeling affectionate or thinking about death or if I use present tense verbs or what sense (read: vision) I’m using for description. But that isn’t the information I turn to when I want to understand my writing better. Besides the words themselves, and there are a couple budding novels in there if I’m not careful – or maybe if I am. Some days it’s hard to tell. The information I gather lends more to understanding the process. I learned I can type off the top of my head and still send words flying out of my fingers over 100 wpm. When I say they’re on fire, that’s pretty close. I learned I can type over 3000 words in an hour. That might seem like a modest 50ish wpm, but keeping it up for an hour or more is daunting. My best time of day is the morning, but I can’t type in the morning because I’m busy with kids. So I almost always do my writing during afternoon naps. When I have to do it in the evening it takes longer, especially if there are distractions like the TV or my husband. [I told you I was writing. Go do something else until I’m done!] Longer often means five times as long, slowing me down to the average at this site, somewhere around 13 wpm when averaged with the distractions. When I get warmed up and set a timer, I can shut out pretty much everything else. It’s really fun to just sit there and commune with the characters while they’re doing weird things. So now I’m working on figuring out how to do that all the time. Because every now and then I end up with random brain dumps that, while helpful, aren’t exactly fueling my fiction word count. Except they do by getting the other stuff out of the way. It’s amazing how full the brain can get just going about your daily business. I keep working to refine what I write, to learn more from this tool, to pursue more goals in my writing. It’s an ingrained habit for me, and whatever else it teaches me, that alone has been good enough to keep me at it. Now what I need is a tool that makes me sit there and edit things on a daily basis. Because having the rough draft out only gets you so far. My drafts are improving, which means some of them are not complete dreck when I spew them out. And today, when I sit down to write my words again, I’ll be figuring out something else to take time and make my words count. It doesn’t always have to be a race for speed. It’s about what I need to get out in order to do the writing I want to complete. What tools do you use to keep your habits going for writing, editing, publishing, social media, other writer-type habits I’ve forgotten? Please share. As long as we’re doing colors, why isn’t it cerise instead of just red or cerulean instead of just blue? I rarely hear anyone talking about aubergine. Is it the one syllable quality of red and blue and green that make them so common? Yellow simply doesn’t have the same impact. Yet it can’t simply be about the name, because pink will never have the impact of a neon orange – and that never rolled easily off anyone’s tongue. When I ask someone’s favorite color, often I get a generic blue or purple or brown. The aforementioned aubergine ranks for one friend of mine, and another told me burgundy. It made me think about my own response, which is much more vague since I am fond of too many colors to pick just one. It’s very dependent on what it is for (a car or a purse or the walls of my bedroom) and my particular mood. How does color affect how you write? Do you search for a specific shade like chartreuse or will bright green work? Do you work to figure out the perfect color for everything or do you leave a few to the reader’s imagination? Does having all that information conflict with your own ideas when reading? I’d love to know! One of the things I love about writing groups is how being connected to them reconnects me to my projects. Another is hearing all the great things they bring to share. They talked about a future meeting and it’s hard to realize we’ll be moving into our new home that day. I’m excited about the new house, but a little sad to be missing part of this group just as I connected with them. Maybe I also needed a new perspective. I mean, I’ve been working on this piece and that for a while, and every group gives something a little different where feedback is concerned. And the new perspective makes me very excited to dig into the project again. If only I had time. I’m about to start packing for this next move! They’re very encouraging, and I wonder how old they think I am. I get the feeling they don’t think I’ve done this much before, but I can’t be certain. The age groups seem to be either older or quite young. And by quite young, I mean two of them were about high school aged. Interesting, but good. It also makes me feel a little more at home, now that I found where some writers congregate. It’s funny the things that make us feel like we’re in the right place, but that seems to be one of them for me. But I think I know what I want to take next time I have a chance to write. And it’s exciting!